Bde Maka Ska-Harriet Trail and Access Improvements	Circulation improvements at Northeast Bde Maka Ska and Southeast Harriet and general trail and access improvements around both Bde Maka Ska and Lake Harriet. Both the Trail Improvements and Intersection Improvements are now 100% complete. This project will implement short term priority projects identified during the Calhoun/Bde Maka Ska-Harriet Master Plan and Improvements project. 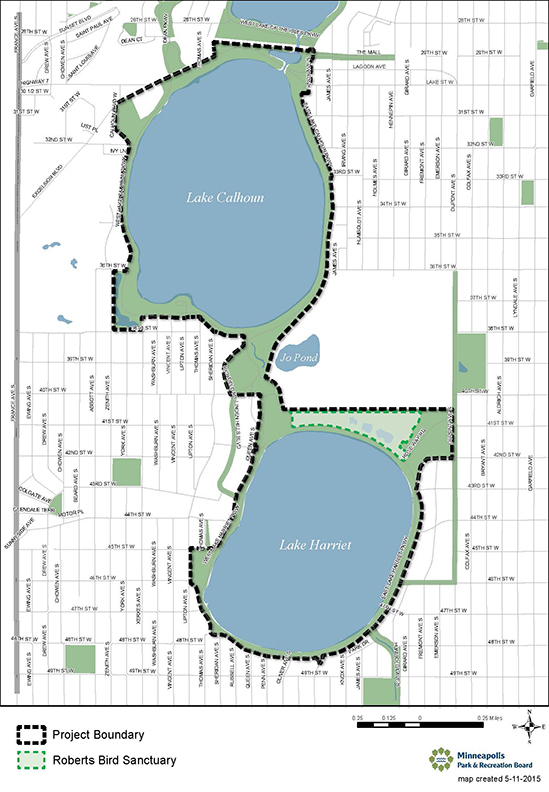 Visit the Calhoun/Bde Maka Ska-Harriet Master Plan and Improvements project page for more information about the project history. A majority of funding comes from the Metropolitan Council’s Parks and Trails Fund. From the 2015 fund, $700,000 is available for planning and implementation. 2015 funds must be used by July 1, 2017. From the 2016 fund, $2.679 million is the amount available for implementation. 2016 funds must be used by July 1, 2018. An additional $360,000 is allocated from the Regional Park Operations and Maintenance Fund for a total project budget of $3,739,000. This funding is utilized for the Calhoun/Bde Maka Ska-Harriet Master Plan, the William Berry Parkway Trail Improvements, the Cloudman Memorial and the Calhoun-Harriet Trail and Access Improvements project.